Pharaohs Fortune Slot is a IGT based online video slot game of 5 reels and 15 paylines. Maximum and minimum coins size for this slot is 1 per spin, however minimum and maximum coins per line for the game ranges from 1 to 200. This slot contains lots of colourful symbols and a great playing environment. This slot includes symbols like snake, an eye, a wolf and an owl. The reels of this beautiful slot are being placed on the backdrop of golden bricks. Players can play Pharaoh’s Fortune Slot for free or for real money at any IGT Online casinos listed here at top10casinoreviews.com. The ‘Line bet’ option in this game can be used to Set the number of coins per line to wager, while “spin” option can be used to set the reels in motion. The game includes a wild symbol which is the logo of Pharaoh’s Fortune. This slot also contains an extra wild known as Sphinx. Both of these wild symbols can replace all other symbols on active paylines excepting the scatter and the bonus symbol. All your winnings will be doubled, if you land 2 or more of the scatter symbols anywhere on the reels. 3 scatter symbols on active paylines will offer you a multiplier of 5x, 4 scatter symbol will offer you 10x multiplier and 5 scatter symbols will offer you 15x. The game offers free spin to the players. You can receive up to 25 free spins in this game. 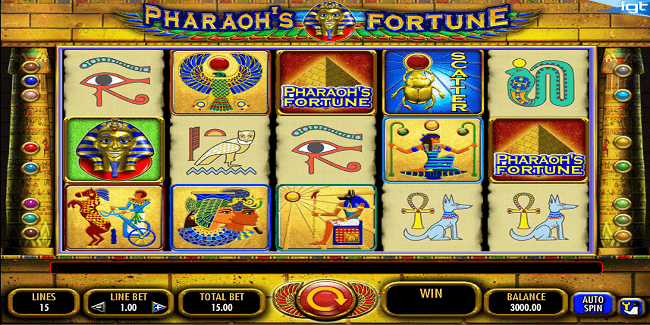 The Pharaoh’s Fortune Bonus feature will be triggered if you land 3 bonus symbols on active paylines.